Please accept our warmest welcome! If you have ANY questions that haven't been answered through our web pages feel free to contact any member via our local repeaters, phones, or email from our contact page. We'll be more than happy to answer your questions and help you in any way possible! 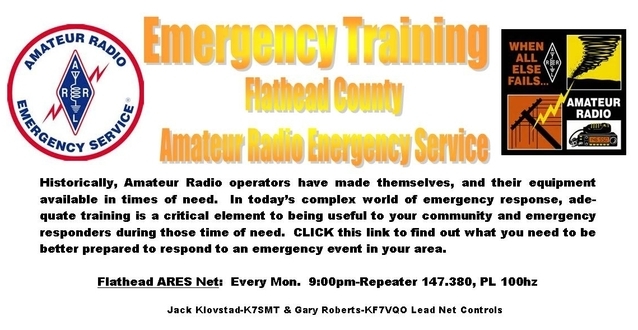 The Flathead Valley Amateur Radio Club, (FVARC), setup this web site to keep you informed of our clubs activities and provide you with FVARC news. We hope these pages will provide you with the information you seek to become more knowledgeable of amateur activities in the Flathead Valley and more involved with our club! Testing for all classes of amateur radio license on June 18, 2019 at 6:00 PM, just before our club meeting at 7:00 PM. Walk-ins will be accepted if testing materials are available. Contact Ed at W7EFL@arrl.net for further information. 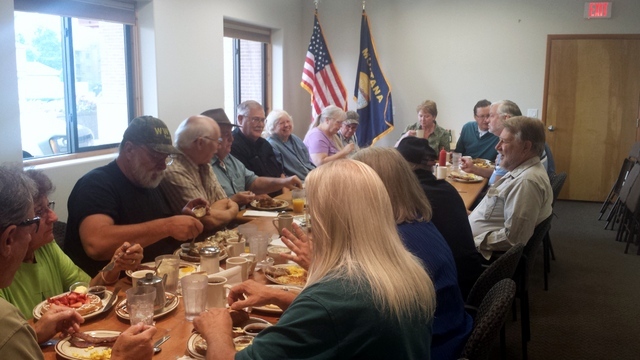 Every Saturday morning at 9am at the International House of Pancakes (IHOP), 2425 Us Highway 93 N, Kalispell. This is an informal get-together for an "eyeball QSO". EVERYONE is invited, especially NEW hams! This is an excellent forum for new hams to be able to sit down with seasoned hams and absorb the hobby! Come on down and enjoy some GREAT Amateur Radio talk over coffee, ham and eggs!